A group of 10 of us attended the villa for a long weekend toward the end of September. Wilrik wasn’t available to meet us but his colleague, Francisco, stepped in to welcome us and show us around. We were all delighted with the property and after stocking up on food and drink from the shopping centre, a short taxi ride away, we were quickly settled and took advantage of the fantastic pool and ample sunbeds. We had a couple of trips to Fuengirola by taxi and a walk down to the beach bars and restaurants at La Cala de Mijas. The walk is pleasant until you reach the main road which is a dual carriage way that you need to walk along. The beach is great though so it is worthwhile, although after a few drinks in the beach bars we did get a taxi back. The Frog & Co restaurant a few doors down from the villa had good food and was a nice option if we didn’t want to travel any further. The villa itself was a site to behold, dominating the road and offering good views out to sea. With ample room we never felt on top of each other although we did spend the majority of time around the pool which is a great size and depth, and heated should you need it, we didn’t as the weather was fantastic. Wilrik was there to see us off and ensure we’d had a good trip, very friendly and a nice touch. A 5 star and strongly recommended villa that I’m sure we will struggle to match next year, so we might well be back! We came to the villa with a group of friends (10 people). The villa was even better than we expected and we fell in love with the villas pool area. The villa was beautifully decorated and there was plenty of space for 10 people. The kitchen had all the neccessary equipment, although I would bring a knife sharpener with me. We didn't always have to cook ourselves or leave the villa to eat, because it was possible to order pizza to the villa. There was a small restaurant near the villa (Frog and Co.) which had amazing food and excellent service. A large group should notify advance if they are coming to eat. Otherwise it was better to go somewhere further to eat. 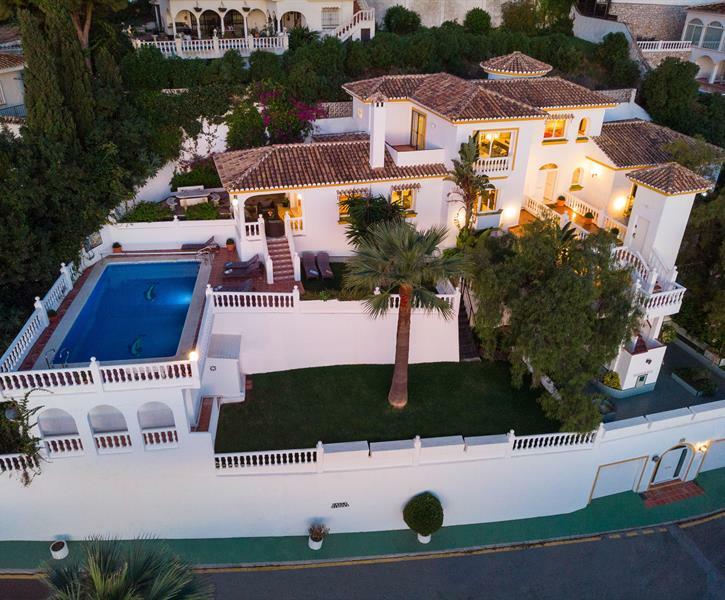 The villa located nicely near Fuengirola and the center of La Cala de Mijas. We traveled by taxi, because it was relatively cheap. We bought our groceries from a large shopping center Miramar which had great shopping opportunities as well. The beach was very near, although we liked our villas pool more. Wilrik was always available and he replied fast and kindly. In addition, getting and leaving the keys in Spain went smoothly! We really recommend this villa! It's hard to find a better one! Hej Wilrik, Thank you for making this whole stay so smooth and pleasant! From the first contact to the actual stay in Villa it was an exceptional experience. Our family (12 people) had a wonderful week - with the perfect view in a beautiful house and (in late March maybe one of the most important things) a perfectly heated pool. We enjoyed our time a lot and would love to come back again!